(Bloomberg Opinion) -- Italy’s populist rulers are famous for their contradictory positions. They’re against bailing out banks, but also oppose bailing in investors. They want to cut taxes and increase spending, but also want to keep public debt in check. They are supposedly in favor of infrastructure projects, but cannot make up their mind on whether a high-speed train link to France should go ahead. The latest policy paradox relates to foreign affairs. The Five Star Movement and the League have spent years cosying up to some unorthodox bed-mates, including Donald Trump and Vladimir Putin, while disdaining traditional European partners like Germany and France. The guiding principle seemed to be opposing the EU consensus while supporting anti-establishment forces. The trouble for the two parties is that it’s easy when you share common enemies with your new friends, but far harder when you want to hang out with someone who doesn’t pass muster. Rome looks set to join China’s controversial Belt and Road Initiative (BRI) this week during a visit from Xi Jinping. But Washington isn’t happy. “Italy is a major global economy and a great investment destination. Endorsing BRI lends legitimacy to China’s predatory approach to investment and will bring no benefits to the Italian people,” the National Security Council tweeted. Stern words. Italy is caught in the middle of a geopolitical struggle that will define international relations for decades. On the one side, there’s an increasingly assertive China, which is using its wealth to buy influence across the world. On the other, there’s a revanchist U.S., which is locked in a muscular confrontation with Beijing over trade. Giuseppe Conte, Italy’s prime minister, is trying to play both sides. In an interview with Italian newspaper Corriere della Sera, he said Italy remained firmly within the Western camp, including the Nato military alliance, but added that he saw no reason to avoid an agreement with China. He argues that Italy has included in the memorandum of understanding some important principles, which comply fully with the EU’s China strategy. This will encourage China to adopt European standards, he says. The government is split, though. 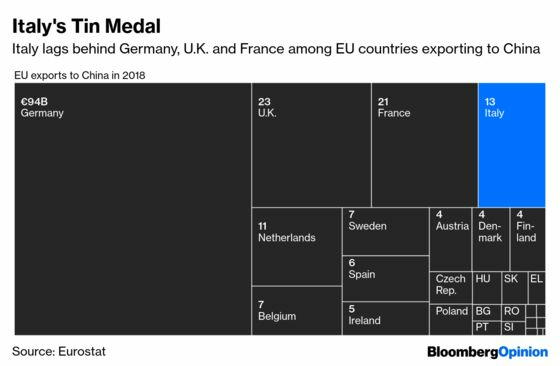 China fans include Giovanni Tria, the technocratic finance minister, and Luigi Di Maio, the Five Star leader. They see the opportunity for bringing investment to Italy. Matteo Salvini, leader of the the League, is more skeptical. He says he his fellow ministers have a point, but he doesn’t want Italy to become anybody’s colony. Yet even Salvini’s nationalist party is divided. Michele Geraci, a junior economy minister and academic with years of experience working in China, negotiated the Belt and Road deal (even though he seems to be getting cold feet). Guglielmo Picchi, the deputy foreign minister who prides himself on his ties to Trump’s inner circle, has called for more scrutiny. Italy is certainly not alone in this awkward diplomatic straddling. Trump’s administration is putting pressure on several countries, including Britain and Germany, to keep Huawei Technologies Co., China’s largest tech company, away from 5G wireless networks. Nor should one forget that previous Italian governments have done deals with Beijing, allowing Chinese investment into the country’s gas and electricity network. But Rome will soon realize it can’t have it both ways. If it signs a memorandum with China, that will immediately cool relations with Trump. Similarly, should Italy perform a U-turn, that would downgrade the Xi visit – hardly a trivial matter. 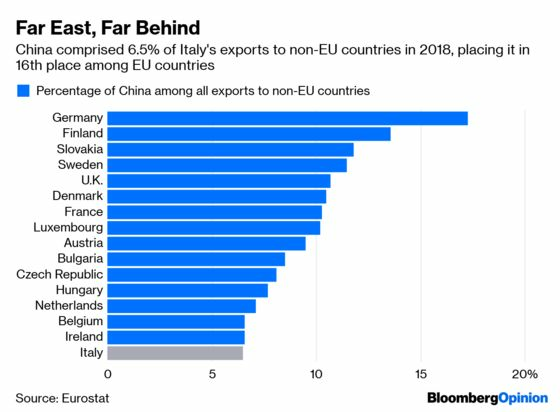 Any move will also impact on Italy’s relationship with its EU allies, who are moving to a more skeptical view on Chinese investment after two decades of remarkable openness. Italy’s government has every right to pick whichever side it pleases. But this won’t be a trivial trade matter, it will be a major geopolitical moment that affects the way the country is seen from abroad. The League and Five Star are finding out that governing is about choices. And they have consequences. Elaine He supplied charts for this piece. Ferdinando Giugliano writes columns and editorials on European economics for Bloomberg Opinion. He is also an economics columnist for La Repubblica and was a member of the editorial board of the Financial Times.